6U Euro card style plug in DC/DC converter module. Telecom input range (-48V), 6 outputs with provision for N+1 redundancy and active current sharing. 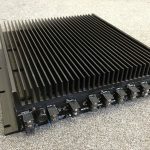 Integrated heatsink for in-rack convection cooling.